Ever since I first tried Ancho Reyes, I was hooked! I mean really, what’s not to like about a 40%AV Chile Ancho Liqueur. I have been trying it in different cocktail menus all around LA (all winners) but I had ben curious to give it a try in the kitchen for sometime now. My first instinct was to use it on a dessert, so when Paola mentioned making Arroz con Leche, it just made perfect sense to bring these two together. We were right; it was just way too good. I am not going to lie to you all though, having a little Chile Ancho on ice with soda water may have helped a bit, but it made our cooking time a lot more fun. Between boy drama and family heartaches, this arroz con leche and Ancho Reyes made for the perfect ending to our latest cooking date. Paola and I look forward to cooking with this a lot more.. Combine the rice, cinnamon stick and water in a medium pot over medium heat and bring to a simmer. Cook for a few minutes, stirring occasionally, until the water is almost gone, about 5 minutes. Add the milk, coconut milk, vanilla, Ancho Reyes Liqueur, sugar and salt. Bring to a boil over medium heat and then lower to a simmer, about 20 to 30 minutes. Remove from the heat and allow to cool. 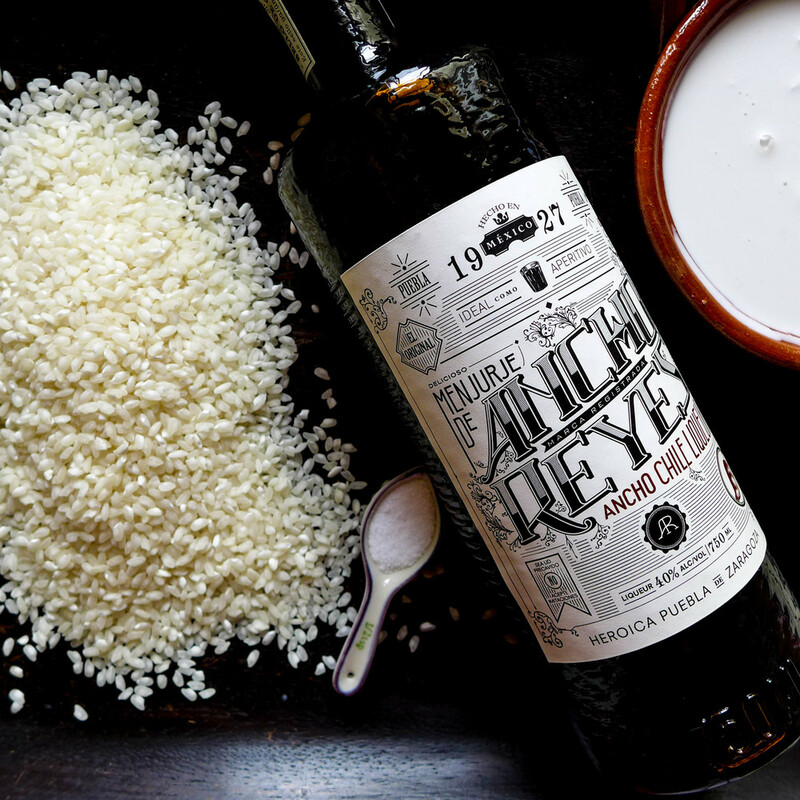 Serve into bowls and pour the remaining Ancho Reyes Liqueur onto the arroz con leche. Sprinkle with cinnamon and chocolate shavings and serve. Posted on April 9, 2014 by Bricia Lopez and filed under recipes and tagged Arroz con Leche Dessert.